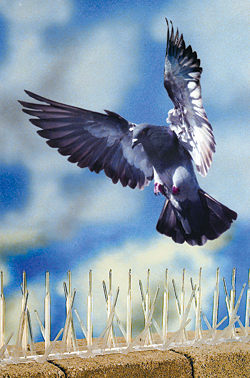 Bird Spike 2000 is a low-cost option that will not harm birds or the environment. The bird spike is an effective, humane way to deter pest birds from landing on window ledges, rooflines, parapet walls, and I-beams. Birds cannot land on the uneven surface, so they move to a more accommodating spot. The spike is comprised of 100 percent post-industrial recycled plastic materials.